Following are questions asked by our readers concerning the rules of baseball and softball, as well as other aspects of umpiring. If you have a question for umpire Joe Rosenberg, click here to Ask the Umpire! The league representitive or the home team has control of the field until play starts. Then the umpire has control. In any weather situation, safety of the players is the overiding concern. When weather moves in the umpire can suspend play for however long he sees fit, within reason of course to see if the weather clears and the field made playable. MLB has waited up to 3 hrs before calling the game. Once the game is called by the umpire, if 4.5 or 5 innings have been completed depending on who is ahead, the game is offical and we have a winner. If we have not reached that point, the game will start over. Once called, the game is over. - J.R.
All codes agree, with two out the batter can run to first even though it is occupied. - J.R. If a manager challenges the bat as illegal, the umpire may examine the bat for obvious tampering. X-rays, sawing the bat are impractical during a game. - J.R. Runners on 1st & 2nd, less than two outs, infield fly rule is in effect. On a high pop fly to the infield, the umpire calls 'Infield Fly, Batter is Out'. If the runners are standing on their bases when that call is made, can they try to advance to the next base BEFORE the ball drops to the fielder since, technically, the batter has now been ruled out and the play would be similar to a tag-up? Or, can they advance only when the ball has reached the ground? An infield fly is like any other and the obligation of the runners are the same. They can advance at own risk if ball is not caught or leave the base after tagging up. Depends on the situation as to when call it. Usually it done at the apex of the ball's flight. One may delay in making the call on windy days, etc. - J.R.
As long as there is no obvious attempt by the batter to hit the ball a second time, it could be, in the umps judgement a foul ball. - J.R.
Ball is now dead, place batter runner on first base only. - J.R.
2 out, R3, deep fly ball to leftfield, R3 crosses the plate before the catch is made. Does the run score and why can't the team appeal using the 4th out advantage rule if they throw to third base? No run can score on the third out int his play. This also negates the 4th out advantage, in this example. In your second example if the ball is struk by the batter and goes directly to the catchers glove and is caught, this is a foul tip, ball is alive. Any other stuck ball that hits the catcher, ground, umpire is just a foul ball and is dead. A called strike that hits the glove and then the umpire is just a live ball. - J.R. The pitcher must allow the batter to get set before pitching. If not the umpire should say something to the pitcher. If the hand is up that means not to pitch and should be a no pitch. By the same token, once both feet are in the box by the batter he is assumed ready for the pitch. - J.R. They are by rule allowed 8 pitches. Unless there is an injury then the umpire may grant more. - J.R.
By the book, yes it is a balk, but rarely enforced. The balk rules are there to prevent deception. A first baseman with his foot over the line is not intended to deceive the runner. - J.R.
Let's break it down. The ball is no longer a pitched ball, it is a ball that is now loose. Keep in mind that this is a judgement call. If you deem that the batter purposely threw the bat to hit the ball and did so to prevent a play, you are within the spirit of the game to call batter interference. Let's keep in mind one thing, a right handed batter will either drop his bat and it will usually end up to the left of the catcher or around the plate area. It is rare that the batter will carry the bat some distance up the line and then drop it. Conversely the lefty will drop the bat and it will tend to sty to the right of the catcher, generally speaking. The lefty will also in some cases be more apt to have the bat near the right foul line. Also did the bat strike the ball or did the ball roll into the bat? Once down the bat is part of the field. - J.R.
Nope. Usually the catcher will roll it to the mound or give it to the ump. - J.R.
As part of a play, the ball was thrown to third base, the fielder missed the ball and it bounced to the opening of the third base dugout (the offensive teams dugout). The dugout is fenced, with an average opening to enter the field. However, a person (non-player, probably a manager) was standing "in the dug out" (feet were on the cement that defines the dugout) but leaning against the edge of the opening and leaning out past the fence a bit. While in play, the over thrown ball hit the person standing in the opening of the dug out and stayed in play. Had that person not been standing there, the ball would have entered the dugout and the call would have been straight forward: dead ball, out of play, 1 1 from time of throw. What should the call have been? Interference, Dead ball, return to last touched base? Or, Dead ball, out of play, 1 1? You have stated that you read the rule in the ASA book. Ok, the defense threw the ball away and with a manager/coach/player standing in dead ball territory the ball struck him. I have a dead ball. Award the base accordingly. - J.R. This is considered a dropped third strike. See OBR 6.05b and notes. Key word is legally caught i.e. in the catcher's glove before the ball hits the ground. Keep in mind the umpire does not award a base here, the batter must earn it by running and beating the throw, tag or any other runner put out by means of a force. - J.R.
All judgement on the part of the umpire. Question is why was the catcher there? Was he in the act of fielding the ball? Was the throw on line? All of these factors wll weigh in the decision. If the ump rules interference the ball is dead, someone is out and the the runners return. In this play, the run counts, runner closest to home would be out and place the batter on the last base touched at the time of the interference call. Obstruction is the defense preventing a runner from doing something. Interference is the runner or batter preventing the defense from making a play. Based on what I have read and not knowing the situation with the throw and why the catcher is on the first base side and in line with the runner crossing the plate, I have no call. - J.R.
Force play is still in effect here. No run. - J.R.
On any interference call the ball is dead immediately. Someone is out and the runners return to the last base legally occupied. In this play it would be the time of pitch base since the interference occured prior to the batter runner gaining first base. Place runners back on 1st and second. - J.R. If the pitch is not thrown, the balk is enforced and the count remains the same the runner just moves up a base. Unless the following occurs, the batter reaches first base on a hit, base on balls, error, or otherwise AND all runers move at least one base, the balk is not enforced. See Rule 8.05 of the OBR and penalty. - J.R. Depends under which rules govern the league. Under the OBR, this is a suspended game and must be finished at a later date. Under rules such as American Legion and High School, the score will revert back to the last complete inning. - J.R.
No, there is no such rule. - J.R. In major league rules, the short answer is no. However, if in the umpire's judgement this altered a play it can be obstruction. At the pro level this sort of thing rarely if ever happens. In Federation rules, this can be a form of taunting or again obstruction, if it alters the play. - J.R.
That is hollywood for you. I don't think anyone has ever seen that happen. But under Rule 5.02, it is in play until the play is completed. - J.R.
With a man on first, the pitcher comes into his set position, steps back off the rubber, turns completely around and throws to second base. Is this considered a balk? A. If the pitcher thows to an unoccupied base this can be a balk, unless the pitcher is making a play. Example: runner breaks for second and the pitcher turns and throws, (Base is unoccupied) and there is a play (Second baseman tags runner). B. This could be a legal move to first provided that the pitcher stepped ahead of the throw to first base. Was the pitcher a lefty or righty? The jump turn and throw is also a legal move. This is where the right hand pitcher removes his pivot foot at the same time jumps and turns. Once the pivot foot is off the rubber legally, the pitcher is now an infielder. More information is required. - J.R. Depends on the league. Usually if a person is ejected, he is replaced by a substitute. Most leagues play by pro rules or some derivation and if you drop below 9 players the game is over. - J.R.
Look under pro rules 6.08 and 6.09 for the answer. You will find that the ball that strikes an umpire before passing any infielder other than the pitcher is considered umpire interference. The ball is dead, the batter gets first base, all runners return to the last base touched at the time of the pitch. Only runners forced move up. In your play you still have 1 out and bases are now loaded. - J.R. This is a proper appeal by the defense. The runner is out. It is the responsibility of the runner to be sure he/she has touched the plate. Once the runner enters the dugout, he/she can no longer come back and retouch. Mechanically, if a play occurs at the plate and if the runner misses AND there is no tag attempt, the umpire should hesitate momentarily and then rule safe. Runner is assumed safe until an appeal is made. - J.R. Under pro rules, this is not necessarily a balk. However under high school Federation rules, this is a balk. Umpires who do more than one type of baseball sometimes get a bit overwhelmed by the small differences in the rules. - J.R. This is a foul tip, not a foul ball. See Rule 2.00 of the OBR. The ball is live and in play, any advancement by the runner is legal. A tip is any ball that strikes the bat and goes directly and sharply into the catchers glove or hand (Other codes have wording similar to this effect). - J.R. In pro rules, there is no thinking about the rule. The DH bats for the pitcher and that is it. If the DH goes into the field, the position is eliminated. In high school the DH can be for any player. The DH can be substituted for, just like any player. The DH can re-enter once, just like any player. Hoever if the DH goes in on defense, the position is eliminated. As far as I understand it. - J.R. This is an out. - J.R. Hate to say it, this is umpire's judgement. - J.R.
Man on first and man on second, none out. Batter hits ball on ground to shortstop. Shortstop picks it up, but runner from second doesn't move off the base. Shortstop runs over touches runner standing on second base, touches second base before the runner from first gets there and then throws the ball to first base for force play on batter/runner. Is the correct call all 3 are out or is the runner at second that didn't risk coming off the bag, safe because he didn't leave the bag? Runner is forced and must move, the tag is out one, the step on base is out 2, and the throw to first if in time is out 3. In baseball, the runner is out even if he is on the base. - J.R.
Not really. Look under 8.02, the penalty is indeed a ball.....and a warning. Ejection is not far behind. So he will do it once, be warned, do it again he leaves the game. - J.R. Under all codes there is no "Must slide" rule. That is a local league "Slide or Veer" to protect the players. In high school there are rules addressing what is a legal and illegal slide. The slide must be toward the base and not toward the runner. There is also a form of this rule in NCAA. Further in high school, they do address hurdling to avoid a tag. In pro rules there is no such provision. - J.R. Under all codes, the batter has given up his right to run the bases once he enters the dugout. He is out. If this is the third out no runs score. - J.R. This is an out! - J.R. Your qustion is rather vague for an answer. At some point during the windup position the non pivot foot will come up in the air and must land after the push off the rubber. This is legal. Please clarify the move so I can better help you. - J.R.
Runner on 1st, nobody out. Pop fly to the first baseman, runner holds the bag. In his attempt to field the ball, the first baseman bumps into the runner, who maintains contact with the bag, the first baseman misplays the ball. Runner advances to 2nd base, batter reaches 1st base because defense if arguing for interference call. My interpretation would be that the runner on first is entitled to the bag since he isn't being forced (has to be tagged up on a fly ball). Umpire judgement as to interference on a play like this. By rule the runner must allow the fielder an opportunity to play the ball. If in the judgement the umpire the is runner is allowing the defense an opportunity to play, and on the fly ball is dropped, the runner on first can move off the bag for second at first touch. The force play is still on. Ok, another twist: was the ball intentionally dropped by the defense? If so, in the umpire's judgement the runner is out and batter will take first base. - J.R.
No run can score on the third out. If the appeal at 2nd is upheld, no run will score. - J.R. The foul tip is a live ball, thus the runner stays at second. - J.R.
Nope. No run can score on the third out unless the third out is made on a time play. While this appears to be a time play it is not. - J.R. If you notice most major league parks and most high schools have a yellow line painted or covering the top of the fence. This is the home run line. Any ball that hits this line or above is a dinger. So the top of the fence is considered a homer. Even if the ball kicks back into the field of play. Rule 2 defines a homerun as a batted ball that leaves the confines of the field in fair territory, is a home run. - J.R.
Well with no runners on this is not a balk. With runners on in pro rules, he can do almost anything until he comes set. The critical point here is that the umpire must judge if the pitcher was trying to deliberately fool the runner. - J.R. In a high school game a catcher gets a base hit. His coach makes a substitution and enters a runner. At the conclusion of the inning, the catcher reenters the game on defense but the umpire is never notified of the reentry. The opposing coach brings this to the attention of the umpire and the substitution is noted and the game moves on. The question is what would have happened if the opposing coach had said nothing and waited until after the catcher hit again and then protested that the team batted out of order? My take on this is that an unannounced substitution is still a substitution and that the catcher in effect had reentered the game legally. Therefore his at bat would have been legal. 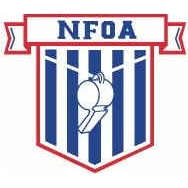 However, in a discussion after the game, the plate umpire was the one who suggested to the coach if he'd waited he'd had an out of order situation. Is this correct? In your play you forget that in high school the coach can insert a courtesy runner for the pitcher and catcher at any time. Why would he use a substitution and rentry when it is not to his advantage? However, again in your play the original player is now back in the game, in the same spot. This is not batting out of oder. Once the player reenters the game, he is in. Here is an interseting scenario for you if he is considered an unannounced reentry. The catcher fields a pop foul ball retiring a batter. The coach now protests the play. Can he and have batting out of order, I think not. My understanding is that the orignal player can re-enter the game at any time. The coach should let the umpire know. However let's not over officate the game. - J.R. This is a force. Just step on the plate for the out. - J.R. In baseball the base is not sanctuary unless it is an infield fly. Runner is out otherwise. - J.R.
Bottom of any last inning withthe score tie. Batt hits one out, circles bases, everone walks off the field. - J.R. This way the catcher does not have to move. - J.R.
Only the proper runner entitled to the base is safe. If you have two runners on second, in this case the lead runner would be entitled to the bag, the following runner would not. If a following runner passes the lead runner, the out is registered immediately. - J.R.
That is correct. The runner can leave at first touch by the fielder on a fly ball. - J.R. Yes, this is an out. - J.R.
Any fly ball or line drive that first touches the ground in foul territory, even if it was a fair ball in flight is a foul ball. - J.R. This is a swinging strike and the ball is dead. So if anyone is on base, they cannot move. - J.R. Pro rules do not have a provision that the runner must return to the base per se. The only rule is after a foul ball, but that is rarely enforced. It is enough for the runner to return to the immediate vicinity of the base before the ump puts the ball back in play. In your play the ball is still alive. The runner is at risk of being put out if tagged off the base. - J.R. Depends on what rules the game is played under. Local league rules may state the player cannot play for any number of games after the ejection. Pro rules the player can be in the next game. Even if the game is called due to rain and the like the discipline should be enforced. - J.R. This is indeed a hit batsman and the batter is entitled to first base. The batter may also offer at the pitch as well and can take the result of the action, i.e., strike, base hit, out, etc. In the case of a batter swinging at the pitch and then it strikes him the hit batter is not entitled to a base and a strike is recorded. The ball is dead in this case. - J.R. If the bounding ball passes over any part of the base, it is a fair ball regardless of where it lands. - J.R. The pitcher is given the strike out, however no out is recorded if the runner advances to the base safely. - J.R.
As to the first point, no there is not any rule governing the number of hit batters unintentionally. As for the second point, once the none pivot foot is lifted and breaks the plane of the rubber, the pitcher is committed to the plate. If the pitcher "Hangs" the kick leg (Non-pivot) foot, this is a balk, the motion to home must be smooth and continuous. The pitcher is allowed to jump turn or step back off the rubber or step and then throw to first. - J.R. If, in the judgment of the umpire, fan interference has occurred the batter is out. Keep in mind the fan, in order to interfere must somehow be over the playing surface. A player reaching into the stands and a fan somehow dislodges a ball from his grasp is not interference. The stands belong to the fans, the field to the players. - J.R. This is a time play. If the run crosses the plate before the out is made at first, count the run. If not, then the run does not count. - J.R. In fall or any ball this is a blown play. Most umpire mechanics for two man state that this is the base umpire call since it is within what umpires call the "V". The plate umpire with a runner on first is moving up the 3rd base line AFTER he reads the play to cover the base runner's advance and possible play at 3rd. If no call is made, one must assume ball down and trap. And if the umpire is wrong, so be it...keep everyone moving and let the defense make a play somewhere. One cannot guess a runner out. The umpire may have to hear some choice words if he did not get the call right, but the players need to be aware of situations. As far as the umpire's decision to call a dead ball and return the runners to where they were, while trying to be fair, this is a wrong call. - J.R. If unable to run, a pinch runner can be called in to to run for him. - J.R. There is no rule to prevent this. The restrictions that there are on the pitcher wearing a batting glove on the glove hand, any thing on the pitching arm such as a sweat band and depending upon level any jewelry that is considered distracting. - J.R. If in the judgement of the umpire the ball is intentinally dropped, the ball is dead, all runners return to the last base occupied at the time of the pitch and the batter/runner is out. - J.R.
Any umpire can call a balk. 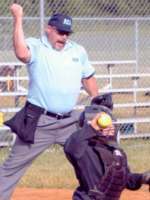 - J.R.
Joe Rosenberg is certified both by the NJSIAA as a varsity official in baseball and softball, is a member of the New Jersey Board of Collegiate Umpires and an ASA National Umpire.